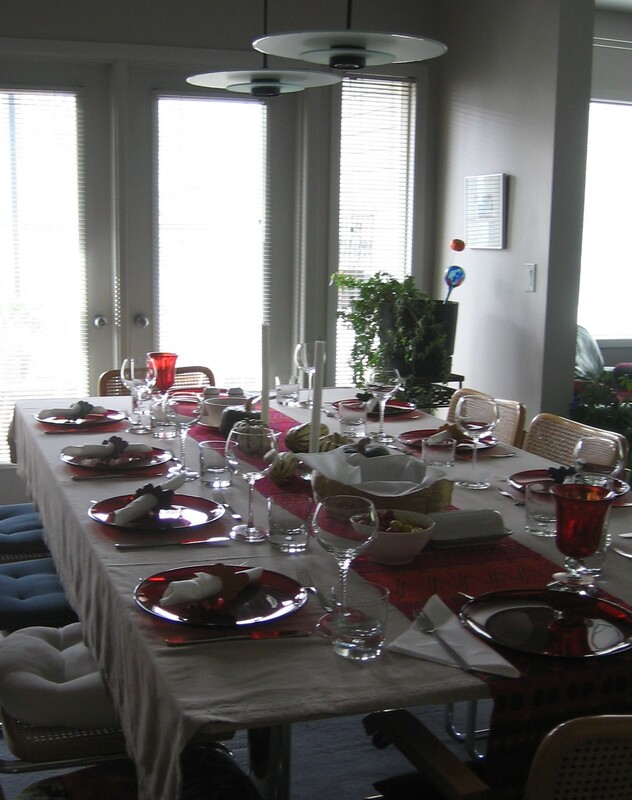 This Thanksgiving we were fortunate to be invited to 2 holiday celebration dinners. Both were outstanding and I am thankful to have such wonderful friends and thankful that they are tremendously talented in the kitchen. I baked desserts for both meals and wanted to share the recipes. The first evening I baked a pumpkin cheesecake using a recipe that was given to me by my sister-in-law many years ago. It’s a variation of a recipe in a cookbook titled “I’ve Got to Have That Recipe” by Barbara Doell, Dianne Winsby and Pat Pollard. It’s easy to make this gluten-free by swapping gluten-free ginger snap crumbs for the graham cracker crumbs. Sorry but I forgot to take any photos at the first dinner. Mix together graham crumbs, sugar, finely chopped pecans and melted butter and press into lightly greased 10″ spring form pan. Bake at 350 degrees for 5 minutes. Cool. In mixer bowl, beat cream cheese and sugar until well blended. Beat in eggs one at a time until mixture is light and fluffy. Add pumpkin and spices and mix well. Beat in whipping cream at low speed. Beat until smooth. Pour into crust and bake at 325 degrees for 1 hour 35 minutes. Combine 6 tbsp. butter, brown sugar and pecans. When cake is barely firm to the touch, remove from oven and sprinkle on topping. Bake 10 minutes more. Cool and refrigerate overnight. Garnish with whipped cream. 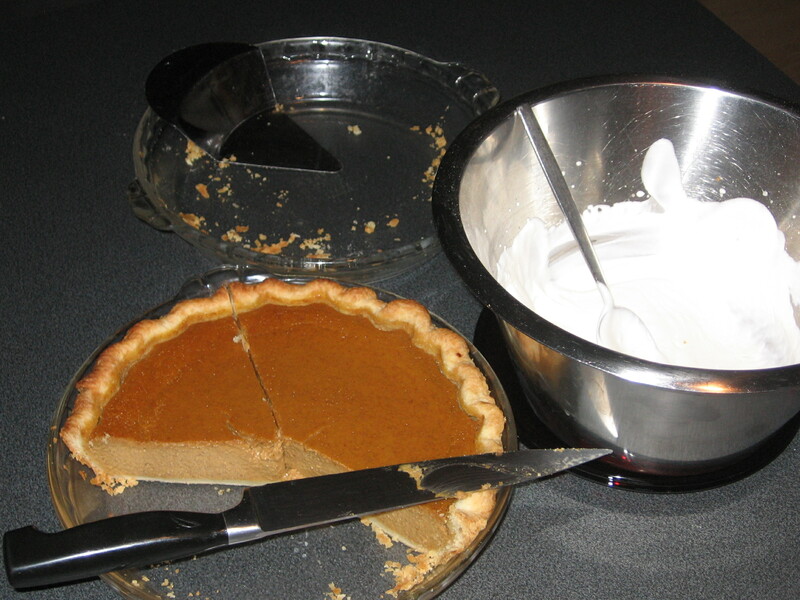 The second evening’s meal concluded with traditional pumpkin pie, which I garnished with tiny pastry oak leaves and whipping cream. I tried a different pastry recipe from Martha Stewart’s Cooking School which I was very pleased with. Hopefully if you try it, you’ll like it as well. 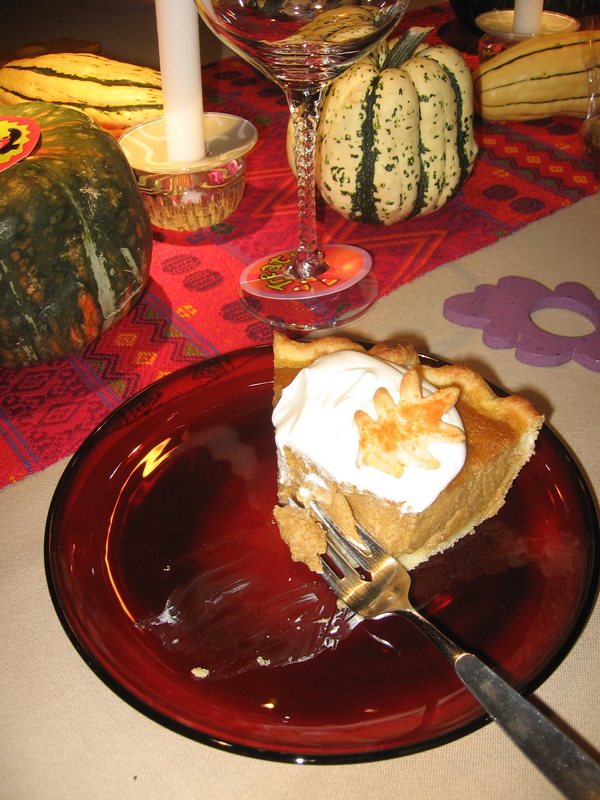 The pumpkin pie recipe is my own, arrived at after a few years of minor adjustments. I hope everyone had a very Happy Thanksgiving! Place the flour, salt, and sugar in the bowl of a food processor, and process for a few seconds to combine. Add the cold butter, and process until the mixture resembles coarse meal, about 10 seconds. With the machine running, add the ice water in a slow, steady stream, through the feed tube, just until the dough starts to hold together. Do not process for more than 30 seconds. Turn the dough out on a work surface and press together. Knead 2 or 3 times to incorporate loose bits. Divide in two. Pat each piece on a sheet of plastic wrap to form a disk. Gather plastic wrap to flatten disk. Wrap well and refrigerate at least 1 hour (or overnight) before using. Take dough from fridge 30 minutes before rolling, and work on a lightly floured cool surface. Beat eggs. Add pumpkin, sugar, spices and cream. Pour into pie shell. Bake at 425 degrees (convection bake). Reduce oven temperature to 325 degrees (convection bake). Bake until filling is set, about an hour. Cover crust edges with foil if browning too quickly. Cool completely before serving. Garnish with whipped cream sweetened with maple syrup or icing sugar. Notes: For regular oven, bake at 450 degrees for 10 minutes, and 350 degrees for 45 minutes. Can be prepared 1 day ahead. Keep chilled. Man that looks good Ms. Terri! No pie for me this year – next year though I’m going to whip up “your” pumpkin cheesecake! Ooooooooo…I wish I was hungry! Just got back from a friend’s house for a really great dinner….But….Your pumpkin pie descriptions are sooooo tantalizing. Your Blogs are such fun.